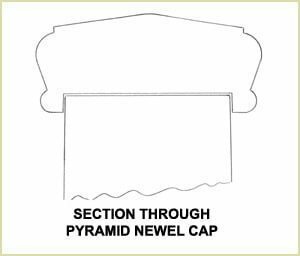 Below are various proposals for fitting different newel caps, from newel caps with dowels or flat and pyramid types. 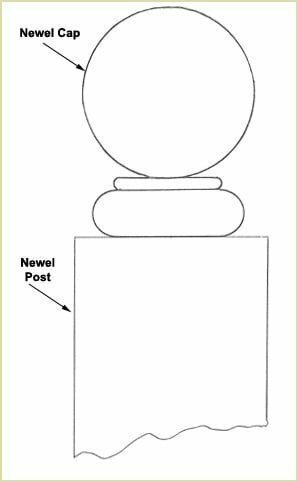 All of the above newel caps have one thing in common and that is the protruding dowel that is fitted into the top of thenewelpost. 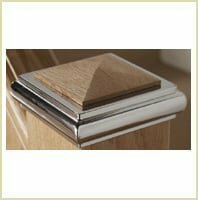 To fit these into the top of the newel post use the following procedures. Take the newel cap with the dowel and saw a crossthrough the end of the dowel, see below. This method is used so that you can put the glue onto both surfaces and have extra glue in the saw cut. If you don't cut a cross and fill it with glue then if the fit between the newel cap and the post is very tight then all the glue will be scrapped away when you push it in. You must next drill a hole the same size as the dowel into the top of the newel post, see below. Mark the centre of the post by drawing across the diagonals of the corners. Keep your drill as vertical as you can and drill a hole at least 5mm more than the length of the dowel. 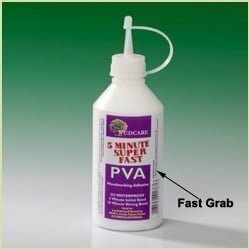 Fast Grab glues which are PVA based which will set fast within 10 minutes. PVA stands for Polyvinyl Acetate glues. This glue is more expensive. Traditional White PVA glue, which dries to a clearfinish, works as strongly as above but will take 24 hours to dry. 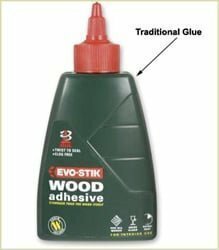 Please Note: Do Not use a PU based wood adhesive. PU stands for Polyurethane. 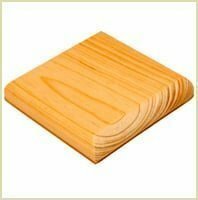 This product works exceptionally well with wood, but only if the joining timbers are strongly clamped. Push the dowel into the end of newel and twist the newel cap through 360° so that the glue embeds in all the crevices. If you can also try and line the grain of the ball cap with the grain of the newel post. Leave the glue to go off over night. 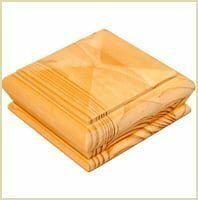 To look at purchasing any of these newel caps browse our softwood and hardwood staircase components on-line shop . All the above newel caps are recessed to fit directly onto the newel post. See below for a typical section. We advise that you use a PVA based glue coated on both surfaces, the same as doweled newel caps, either 5 minute PVA or a traditional PVA. Please Note -We do not recommend a polyurethane based glue on newel caps because the glue will lift the caps off and they will be left not level. 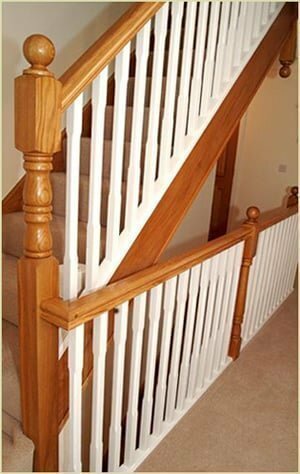 Pear Stairs sell newel caps in all shapes and sizes but remember if you have any questions don't hesitate to phone us about your newel cap choice. We are a very friendly company, phone Pear Stairs on 01938 553311.